The world’s governments are meeting again, 4 years after the Paris Climate Summit, to attempt to increase the level of ambition and commitment towards ending our global climate crisis and meeting the Paris agreement. 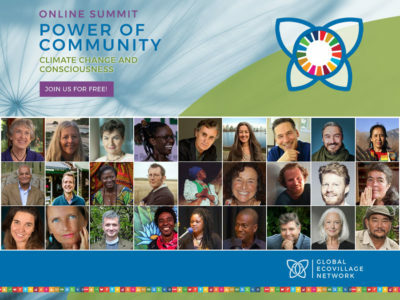 Fortunately, organizations like the Global Ecovillage Network (GEN), including thousands of ecovillage communities and like-minded community based and oriented organizations, are already showing how this can best be done with hands-on approaches towards solving our climate challenges at a local to global level and scale. 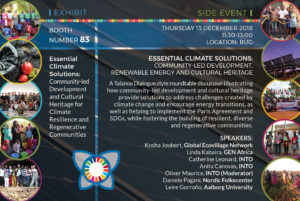 A Global Ecovillage Network delegation of 10 people from 7 different countries, representing all GEN regions, will thus be traveling to Katowice, Poland to share many of these best practices and success stories at the UN’s 24th annual climate change conference, COP24 from 3 – 14 December. Examples of these are featured on GEN’s website at ecovillage.org/climatesolutions. We will partner once again with the International National Trust Organisation (INTO) and the Nordic Folkecenter for Renewable Energy. GEN recognises the urgency that we are faced with and in response advocates for community-led development and a range of ecovillage solutions. Ghana Permaculture Institute has implemented sustainable projects that mitigate carbon buildup in the atmosphere on a large network scale. GPI currently has about 8000 farmers in Ghana who use permaculture and organic farming practices. Through education and training, these farmers gain knowledge and are able to implement farming practices such as tree planting, mulching, mix cropping, mix farming and crop rotation. In addition, they are taught how to recycle their organic matter into compost as a fertilizer and also recycle sawdust into edible mushrooms. Tamera Ecovillage in Portugal has brought a dry inhospitable region back to life using water retention landscaping, keyline contouring and water retention ponds. This has been achieved despite the community being in a drylands region where the streams would normally go dry within weeks after it rains. As a result, the land has now been transformed biodiversity restored. Now the streams run year round in this verdant ecotopia, with fruit orchards, a vineyard, and an abundance of plants and animal life. Irish Showcase Ecovillage, Cloughjordan measures its climate impact in four dimensions of sustainability and finds it has a significantly lower climate impact than the national average. Cloughjordan’s low-carbon lifestyle is supported by its Ecological Charter which specifies the ecological standards for building in the ecovillage, ensuring that the homes are low-energy and ecological in the materials used. Its district heating system supplies the water that heats all its homes in a carbon-neutral way, using only renewable energy. In addition, the Community Supported Agriculture farm, composed of members from the ecovillage and the surrounding community, grows food using organic and biodynamic methods, and systematically regenerates the soil. These examples give a taste of what ecovillages have been doing for decades and demonstrate how these objectives can be best achieved, provided that sufficient funding is given for scaling up and replication. As Albert Bates, a member of GEN’s Advocacy Working Group, recently said: ‘The regenerative future we are advocating for is not conceptual but actually happening’. The focus of COP24 is on scaling up government ambition: increasing financing and implementation at the local level for carbon drawdown, sequestration, and increasing eco-system services. 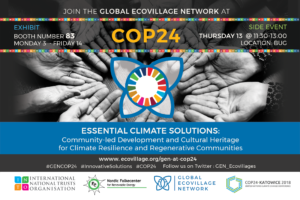 At COP24, the GEN delegation will therefore show how ecovillages are already living laboratories of climate resilience worldwide. NOTE: GEN Press Conference to take place Thursday 6th December, 17:00! See below flyer for more information!